Ydun 5.5 is a classical scout tent with a square ridge pole construction and lots of space for 4 people sleeping. It is very easy to pitch and the breathable cotton fabric ensures a great sleeping environment. It is equipped with a double entrance in each end for easy access and at the same time it offers great ventilation and panoramic views of the outdoors. Two adjustable windows with mosquito nets and curtains in each side and mosquito net in both doors makes ventilation easy and effective. 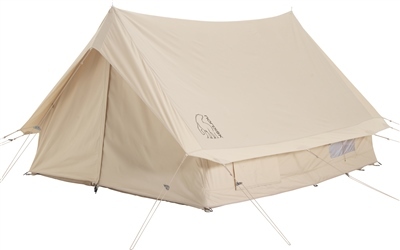 Ydun has a built in groundsheet with an easy clean fold by the main entrance. A tailored cabin is available as accessory. Ydun or Iðunn is in Norse mythology the goddess of youth. She is the wife of the skaldic god Bragi, who is son of Odin, and she is the keeper of the magic apples, that grants eternal youthfulness – not least to the gods in Valhalla. The name Iðunn means "ever young", "rejuvenator", or "the rejuvenating one", and is sometimes anglicized as Idun, Idunn or Ithun – occasionally with an -a suffix to denote femininity like Iduna and Idunna.